Born on April 15, 1841, Jim Creighton was baseball’s first real star and made his pitching debut with the Brooklyn Niagaras at age eighteen in 1859. He would join the Brooklyn Star Club that year and then join the Excelsior Club, in 1860, for “under the table inducements.” Although it is difficult to prove, he was probably the first paid player. On June 30, 1860, the Excelsior Club boarded a train and embarked on the first great baseball tour. They started in upper New York State and on July 2 defeated the Champion Club of Albany, 24–6. On July 3 the Victory Club of Troy fell to the Excelsiors 13–7. They enjoyed a 50–19 victory against the Buffalo Niagaras on July 5. Wins in Rochester, NY and Newburgh, NY followed and the Excelsiors returned to Brooklyn on July 12 to prepare for the Atlantic Base Ball Club. On July 19, some 10,000 fans turned out to watch pitching ace Jim Creighton win easily 24–4. Afterwards they turned south in response to many invitations and played the Excelsior Club of Baltimore and won 51–6 on July 22. The trip concluded with games in Philadelphia, Maryland and Delaware, with the Excelsiors winning every game. At the time Creighton pitched, the ball had to be delivered with a stiff-armed underhand motion. Creighton was said to be one of the first to bend the rule. He inaugurated speed pitching by adding an almost undetectable wrist snap and arm bend to his delivery. From 45 feet away he threw his rising “speedballs” and then threw slow pitches he called “dew drops” to further confuse the batter. During this time the pitcher’s job was to help the batter and not hinder him. Fielding was to decide the game and some detested his aggressive approach. On November 8, 1860, Creighton would record baseball’s first shutout. He was also an excellent hitter, scoring 47 runs in 20 games that same year. During the 1862 season, he was reportedly retired only four times. On October 18, 1862, playing against the Union Club of Morrisania, NY, Creighton hit a home run. John Chapman, who was on-deck, heard something snap during Creighton’s swing. After Jim crossed home plate he assured Chapman that his belt had broken. Four days later the Excelsior star was dead having ruptured his spleen or bladder in the process. He had bled to death of internal injuries. Jim Creighton was 21. He has not been inducted into the Baseball Hall of Fame. People ask me what I do in retirement. For the most part, I research baseball. The St. Louis Cardinals History became my first passion and I have produced a website of over 650 pages called History of Cardinals. I update and research that almost daily. Also, in this research, I have come across all kinds of stuff related to baseball and its history. This post today and others to follow will be about baseball and its beginning and how it has changed over the years. I hope you enjoy this information and come back for more. The next segment will be in about two weeks when I get into the rules and how they have changed over the decades of baseball. Feel free to email me (Tom Knuppel) at tknuppel@gmail.com for any thoughts, questions or other things concerning these posts. Baseball likely originated from a game that was played in Great Britain called “rounders.” It had several other names but this is the most widely used name. But America wanted its own game. One that they could say was invented and played in the United States first. Herein, lies the rub. It may have been an original but can we be sure? 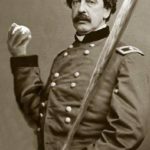 Abner Doubleday is known as the inventor of the game. Let’s look at some facts. During the 1950’s, the game in Massachusetts was played on a square field that had four foot high posts in the ground as bases. Each team had 10-14 players and the umpire would ask those in attendance for help in making the calls. Also, the umpire awarded the win to the first team to score 100 runs. The first games of baseball by Doubleday were said to be played on a smooth section of a field near Cooperstown, New York in 1839. That was said to be the beginnings of baseball. But there are issues with this story. 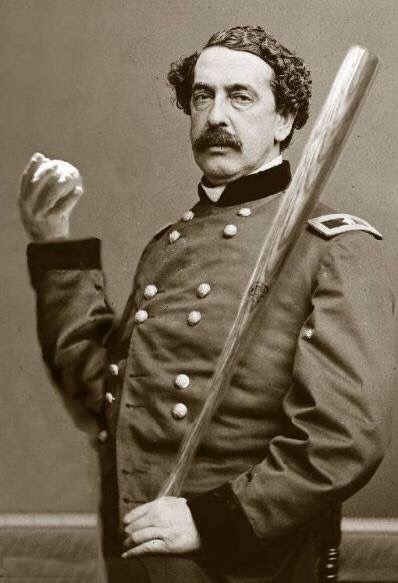 Abner Doubleday was a young cadet at West Point in 1839 and never got to Cooperstown. Children have hit balls with bats as long as there have been children, but baseballs most direct ancestor was probably the British game of cricket. Americans began their variations of the game and called it names such as, “old cat”, “one old cat,’ “two old cat,” “goal ball,” town ball,” “barn ball,” “string ball,” stick ball,” “base,” and “Base Ball.” Even Lewis and Clark while exploring our country tried to teach the game to the Nez Perce Indians. Forest City, located near Cleveland, defeated the Brooklyn Atlantics in five innings in 1870 by the score of 132-1. In another game during the same time frame, Forest City scored 90 runs in the first inning when the rains came while they had bases loaded. The game got rained out. 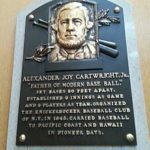 Many historians have turned their attention to Andrew Cartwright as possibly making the largest contribution to the invention of baseball. 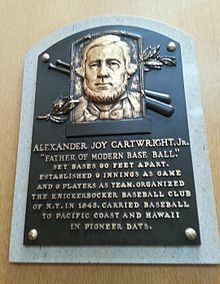 In Cooperstown, NY, where the Baseball Hall of Fame is located, they have given Cartwright the title as “Father of Modern Base Ball.” as can be read on his plaque in the building. Cartwright was a bank teller in New York and he organized the first team called the Knickerbockers. He wrote a set of rules for the game and set bases 90 feet apart, had teams set a batting order that was static and each half inning ended after three outs. The bases were made of about anything including rocks. The batter or runner could be out by someone simply hitting them with a thrown ball. Many times, it was squarely in the middle of the back. The first game played under his rules ended when the New York team scored their 21st run (which was called an ace) in the fourth inning (innings ere called a hand). 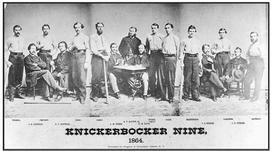 The game ended with the Knickerbockers losing 23-1. The first game was played on Elysian Fields (which they rented for $75 per year) in Hoboken, New Jersey on June 19, 1846. Cartwright was the pitcher and umpire for this game. His intention was to teach the players the rules he had written. In fact, he was unhappy with a player swearing and fined the player six cents for the tirade. By 1849, the game was common enough that players began wearing uniforms to play the game. It wasn’t until 1857, that the nine inning rule replace the 21 runs to end the game. 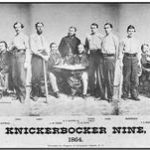 One player from the Knickerbockers that stands out is Doc Adams. He was a Graduate of Yale and Harvard Medical School. He loved baseball and was the inventor of the shortstop position. He stated that a fielder was needed to handle short throws from the outfield as other players had to cover their base. He also was instrumental in the elimination of the “bound rule.” Previously, if you caught a ball on one bounce the batter was out. Another rule was the pitching rubber would be 60 ft from the rubber.The person who set up the first field had trouble reading the measuring stick and mistook a 6 for a zero. Therefore, he set it at 60′ 6″. Even though accidental, this has stayed constant through the years. Doc Adams went on to be the President of the Knickerbockers along with being a member of the State Legislature in Connecticut. Games became popular and teams sprung up in many areas of the country. Chicago businessman, William Hulbert, was part of the Chicago White Stockings governing board. He had a plan to get some teams together and schedule regular games. Some teams met in Louisville in 1876 and established the National Association of Baseball and eventually shortened to the National League. That is the reason it is known as the “senior circuit” because it started first. Hulbert is in the Baseball Hall of Fame. Eight teams started the league that planned to play a 70 game schedule. 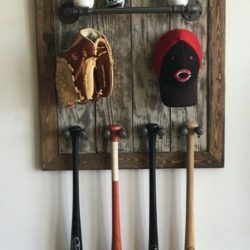 The teams were the Chicago White Stockings, Philadelphia Athletics, Boston Red Stockings, Hartford Dark Blues, New York Mutuals, St. Louis Brown Stockings, Cincinnati Red Stockings and the Louisville Grays. Before the conclusion of the season, the Mutuals and Athletics were expelled for not taking their final trip to the western cities. At each National League game, the cost of admission was 50 cents. However, if you waited until the 3rd inning was over, you could get in for 30 cents. On May 2, 1886, the first National League home run was hit by Ross Barnes of the Chicago White Stockings. He never hit another homer in his career. The game of baseball had issues. The biggest problem was player movement. Nothing kept them with one team. After a season, there was a raid on the best players by giving them more money. In 1879, the first reserve rule was put in place. Each team could name five players as untouchable. Later, it moved to 11, then 15 and finally the entire roster. The big test came in 1882 when a new league was formed called the American Association. They had no allegiance to the National League and went after players. Eventually, an agreement was made and rules were set in place in 1883. Abraham Mills, president of the National League got the agreement signed that set up an 11 player reserve list, guaranteed territorial rights, minimum salary ($1,000) and a postseason game between the two best teams of each league. This created the World Series. Old Hoss Radbourn won 309 games in 11 seasons which included a 28-0 shutout for his Providence team over Philadelphia on August 21, 1883. In those early days of baseball, pitchers were to throw underhand and keep their elbow wrist straight. The batters got three missed swings before they were called out. Back in the earlier days, Chadwick was concerned that the “seedier” element of man might get involved in the game. Sure enough, people, including players, began betting on the game. The Mayor of New York, William “Boss” Tweed, the corrupt boss of Tammany Hall, got involved to the detriment of the game. A scandal came about in New York as the mayor gave his catcher, third baseman and shortstop each $100 to throw the game (it was called to “heave” a game in the olden days). These players were banned to play in their league. Did You Know? Abraham Lincoln played baseball in the late 1850’s and early 60’s? Lincoln was playing baseball in 1860 when a messenger showed up to deliver the news. Lincoln insisted he didn’t want to be interrupted and had the guy wait until the game was over. The news was telling him he had been nominated to become President of the United States. Later while President, he could be seen on the White House lawn with a bat an ball in his hand. It is reported that apparently, he skipped cabinet meetings to play on the White House lawn. A new league was attempting to form from the outshoots of the American Association. It used the goals of promoting honest competition that wouldn’t use the reserve clause to make up teams and would cater to crowds with low ticket prices. The president of the new league, called the American League, was Ban Johnson. The new league formed on November 14, 1900, and had eight cities with franchises. they were Washington, Philadelphia, Milwaukee, Detroit, Cleveland, Chicago, Buffalo and Baltimore. They decided on a 140 game schedule and each team was allowed 24 players on their roster. The players for this new league were primarily from the National League. As an example, Cy Young left the Cardinals to play in the American League. The best player in the league was Nap Lajoie who left the National League Philadelphia team to play for the American League Philadelphia squad. He hit .426 for his new team and it caused controversy in Philadelphia. People were not nice to him which caused his trade to the Cleveland Indians. Things got so bad that when the Indians came to town, Lajoie left the team and spent those days at the beach so the chaos didn’t prevail. In January 1903, the two leagues got together and created an agreement to not allow players to wander from team to team. Also, they realigned the teams in the leagues to create balance. Baltimore player/manager John McGraw discovered a talented second baseman but the problem existed that he was black. Black players were not allowed. So he tried to hoodwink the league and claimed the player, Charlie Grant, was a Cherokee Indian named Tokomoma and should be allowed to play. other executives saw through this ruse and he was not allowed to play in the American or National Leagues. The Deadball Era was just as it sounds. In 1906, the Chicago White Sox hit seven home runs in 154 games. In the World Series of the season, the White Sox and Cubs hit no home runs at all. Cy Young was one of the most dominant pitchers of his era. In 1904, he tossed 23 straight hitless innings. He tossed two hitless innings on April 25th, six hitless innings on April 30th, a perfect game on May 5th and six hitless innings on May 11th. The next section in a few weeks will be The Rules. I will look into how they have evolved and some strange things that have happened under those rules. Looking for a New Baseball Book to Read in 2018? 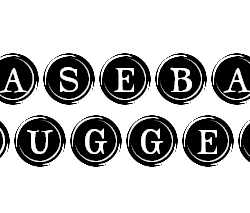 Posted by Tom Knuppel on Feb 27th, 2018 in Sports | Comments Off on Looking for a New Baseball Book to Read in 2018? There are many new baseball books for your reading pleasure that are coming out in 2018. Here is a list (likely not a complete one) of the books that come out (some are out) January 1 to June 30, 2018. I will be reviewing several of them after they come out at KnupSports. Two weekends have gone by and many of the top teams will remain there. Cal State Fullerton has stumbled out of the gate as has North Carolina. Another that was knocking on the Top 25 list that has struggled is Dallas Baptist. Looks look at the scores from the past week of the Top 25 teams. (2/23/18) This is the 2nd weekend of college baseball. There have not been too many surprises among the results but there has already been one coaching firing and that was at Mississippi State. The first match-up to pay attention to is #1 Florida taking on #9 Miami. The LSU #16 faces #21 Texas at home.